I don’t think there is a single part of my life where I haven’t dealt with fear. I worry about my kids, my husband/marriage, my loved ones, money, health, the state of our world, life, the future, what everyone is thinking, how will I have enough time next week, and don’t you dare show me a picture of a snake unless you want me to slap you. Put one in front me? Well, you’re just mean. All of that at some point has deeply scared me… and some I deal with on a daily basis. God doesn’t want us to fear. 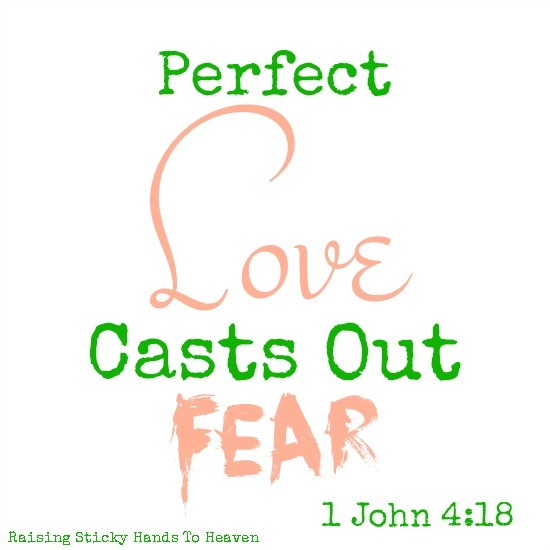 There a numerous times in the Bible that fear is mentioned, and over and over again it is stated that we have no reason for it. For our minds to comprehend that is impossible, though, right? With what we see on the news and happening to those around us? When our faith is in God, when we know His love and let it envelop us, our focus on Him and making everything else fall behind it… That is when we are able to live without fear. Why? Because we know that we are putting our love and trust into the creator of the universe, and He has our best interest in mind. His love forces every fear to leave us, but only once we put our full and complete trust in Him. A servant cannot serve two masters. Love and fear cannot reside in the same house. Which one is living in your heart? Don’t allow yourself to be tormented. Choose love. How many of us worry? That’s what I thought… It only comes natural. It’s what we do… But we’re not supposed to. Tough stuff, huh? 19 But my God shall supply all your need according to his riches in glory by Christ Jesus.20 Now unto God and our Father be glory for ever and ever. Amen. When things like this in life happen… whether the every day worry or the great worry… it’s all up to Him. He knows what’s going on. He knows what he’s doing. Better than we could ever understand. It is the time to get on our knees as He has called us to do and give it all to him! God bless & DON’T WORRY!